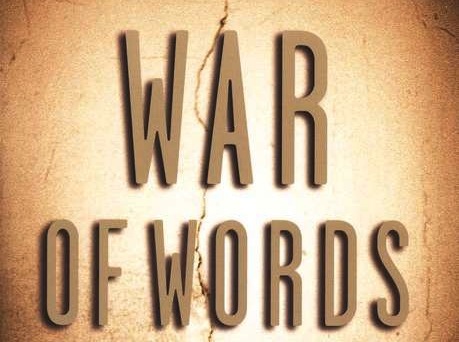 EGYPT: WAR OF WORDS …. Tuesday, the White House said media reports that suggest the US cut off aid to Egypt are not accurate, adding that the Obama administration is still reviewing its options. The White House will hold a Cabinet-level meeting to discuss cutting some of $1.5 billion in US aid to Egypt. Also Tuesday, the White House said media reports that suggest the US cut off aid to Egypt are not accurate, adding that the Obama administration is still reviewing its options. “That review has not concluded and … published reports to the contrary that assistance to Egypt has been cut off are not accurate,” White House spokesman Josh Earnest told reporters in a briefing. Earnest also said that Egypt’s detention of Muslim Brotherhood leader Mohamed Badie was not in line with the standard that the United States would hope to uphold in protecting basic human rights. Earnest confirmed that a National Security Council meeting of top officials will take place Tuesday. Cabinet members such as Secretary of State John Kerry will participate. Up to now, the administration has insisted that it has taken no final decision on halting aid to Egypt since the military’s July overthrow of Mohamed Morsi’s Muslim Brotherhood-led government and an intensifying crackdown on Islamist opponents. Both officials said Egypt aid would be the focus of the meeting. One official said a decision was likely on cutting some elements of US economic and military support. *Yves Engler’ is the author of The Ugly Canadian: Stephen Harper’s Foreign Policy andCanada and Israel: Building Apartheid. 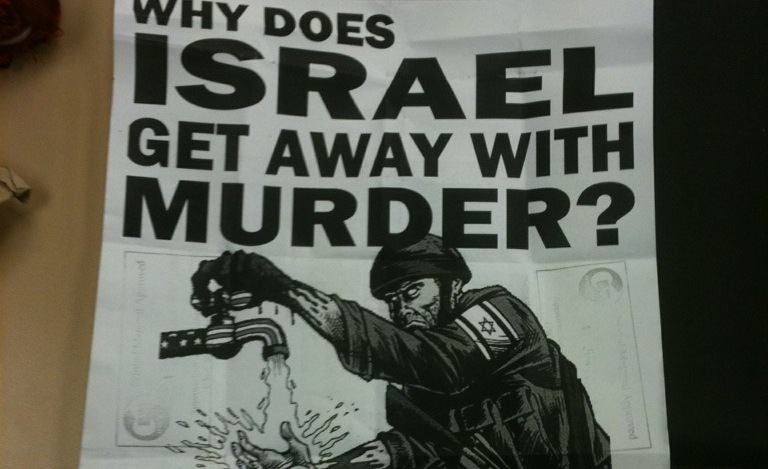 As a matter of fact, the ADL and the entire American Jewish establishment should suspend their campaigns against anti-Semitism indefinitely and take a look at what’s going on in Israel. When the Jewish state is this riddled with racism, its advocates abroad should be a little less outraged over the offenses of gentiles. They should be a little more humble — and a lot less hypocritical. Jews were outraged when Jesse Jackson referred to New York as ‘Hymietown.’ Where’s the anger over Israeli public figures’ rampant racism? The Anti-Defamation League and the rest of the American Jewish establishment owe Jesse Jackson a big apology. They put the man through the wringer, they made him apologize in every possible forum for his “Hymie” and “Hymietown” remarks back in 1984. Yet look at the kinds of things Israeli leaders — senior government ministers, chief rabbis — get away with without ever having to apologize, without ever being punished in the slightest. Two days later the newly-elected Ashkenazi chief rabbi of Israel, David Lau, was seen on a video telling an audience of yeshiva boys that they shouldn’t watch European basketball games in public. “What difference does it make,” Lau said, “if the kushim who get paid in Tel Aviv beat the kushim who get paid in Greece?” Kushim, especially when used in a dismissive context like Lau did, is a well-understood derogatory term for blacks. So really — what was so bad about “Hymies” and “Hymietown”? Or the thousand other anti-Semitic or even just possibly anti-Semitic remarks that the ADL and other American Jewish organizations have “pounced on” since then? Israeli public figures say the same kind of garbage, the difference is that they never, ever pay a price for it, in fact they usually manage to play the victim and get away with it, and at worst will be obliged to offer some backhanded apology. Likud lawmaker Miri Regev is doing fine after having called Sudanese refugees “a cancer on our body” to a crowd of hopped-up south Tel Avivians in May of last year, shortly before the crowd went on a window-smashing mini-pogrom against the Africans in the neighborhood. Legendary basketball coach Pini Gershon’s career and public stature didn’t suffer at all after he explained his racial theory about blacks to a class of amused army officers in 2000. Imagine the scandal if an American political leader boasted publicly that his cuts to child subsidies had reduced the “non-Christian” birth rate. Imagine the ADL’s reaction. But in Israel, in 2007, from the mouth of a once-and-future prime minister — nothing. These are just a few of the more appalling examples of the kind of racist remarks that Israeli politicians, rabbis and celebrities feel free to make. I haven’t even mentioned Avigdor Lieberman and Rabbi Ovadia Yosef. As a rule the words are directed at Arabs, now and then against blacks: either Ethiopian Jews, African refugees or athletes. I’ve lived roughly half my 61 years in the United States, the other half in Israel. There is absolutely no comparison between American tolerance for public displays of racism and Israeli tolerance for it. I’ve stood in the middle of Israeli crowds chanting “Death to the Arabs.” I’ve sat in a Tel Aviv soccer stadium watching and listening to an entire section of fans erupt in monkey sounds – “Hoo, hoo, hoo!! Hoo, hoo, hoo!! – after a black player on the visiting team scored a goal. And the leaders of the U.S. Jewish establishment, Israel’s most valued, devoted, determined friends, keep pouncing on every untoward or conceivably untoward remark about Jews or the Jewish state. Yes, the ADL will send out a press release about its “concern” over the “inappropriate” remarks made by some relatively minor Israeli figure. 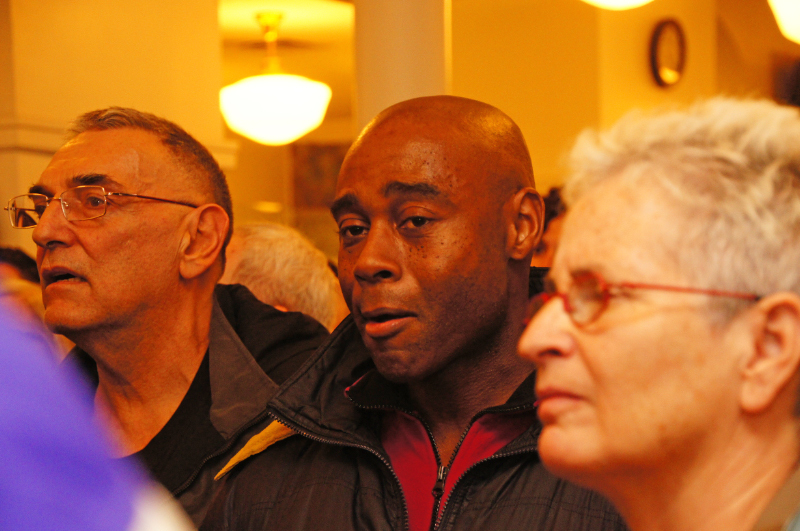 A few others in attendance …. [W]hen a department of a university officially co-sponsors and endorses an event advocating BDS against Israel, and refuses to co-sponsor and endorse an event opposing such BDS, that does constitute an official endorsement. 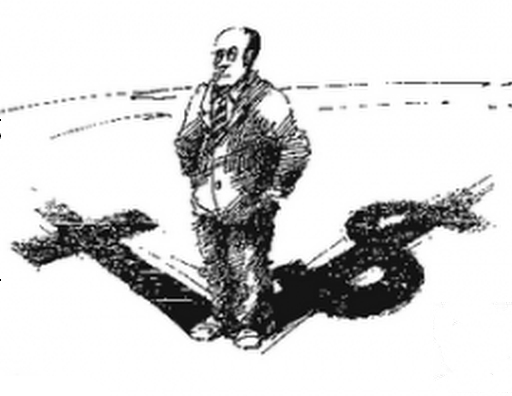 Freedom of speech, and academic freedom require equal access to both sides of a controversy, not official sponsorship and endorsement of one side over the other. The heavy thumb of an academic department should not be placed on the scale, if the marketplace of ideas is to remain equally accessible to all sides of a controversy. One political science student at Brooklyn College said she was afraid to criticize her department because “that’s going to put a target on my back.” Other students talked about a “chilling effect” that the department’s decision would have on them. And yet another student said that she had “an uncomfortable feeling” about raising her hand and arguing “with a professor who voted for it” and who tried to justify his vote in the classroom. So according to Professor D, the problem is that departmental sponsorship of political events jeopardizes the academic freedom of students who will then feel “uncomfortable in class” and vulnerable to retaliation if they publicize views contrary to those “endorsed” by the department. In preparation for his column about the BC controversy, Glenn Greenwald emailed Dershowitz, resulting in a rather contentious exchange posted in full by Greenwald. Among other things, Dershowitz stated: “I would oppose a pro Israel event being sponsored by a department. . . I recently told someone who invited me to give a talk on Israel that the talk should not be sponsored by the school or a department.” When Greenwald asked for details about his request for no sponsorship by school or department for one of his speeches, Dershowitz mysteriously failed to respond. Dershowitz, as a lawyer trained to anticipate contrary views, should have known better. He himself is a prolific lecturer, and has given political lectures sponsored by a university department, a sin he now considers so egregious that he has devoted several columns to exposing it. Just one year ago, Dershowitz was invited to speak against BDS at the University of Pennsylvania. That lecture was sponsored by both the University’s Political Science Department and its Philosophy, Economics and Politics Department. Greenwald updated his column with this glaring hypocrisy. And, unlike the BC situation, in which Dershowitz speculates that the Department would deny sponsorship of an anti-BDS lecture (I would speculate otherwise), Penn’s Poli Sci Department really did choose sides, refusing to sponsor the BDS conference held at the school at the very same time but explicitly sponsoring Dershowitz’s opposition speech. In response to this revelation, Dershowitz had no choice but to dig himself a deeper hole. When I agreed to give that talk, I was told that the event was being sponsored by Hillel alone. I was not and am not aware that it was also sponsored by a department. Had I been aware, I would have opposed such co-sponsorship, since I do not believe that academic departments should take official positions on issues of this kind. Shouldn’t that have set off alarm bells to someone who feels that students are so aggrieved by one-sided lectures sponsored by a university or department? And what did Dershowitz do in response to Cohen’s introduction? Did he begin his speech decrying the official endorsement of his anti-BDS appearance, saying it would adversely affect Penn students who hold contrary views? 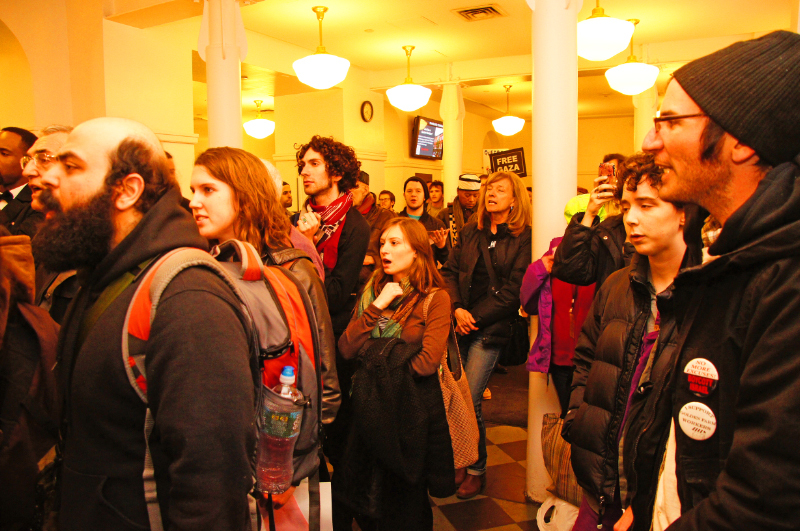 Did he raise a protest to President Gutmann that her avowed support of Israel would make pro-Palestinian rights students “uncomfortable” on campus and in the classroom? Yeah, right. 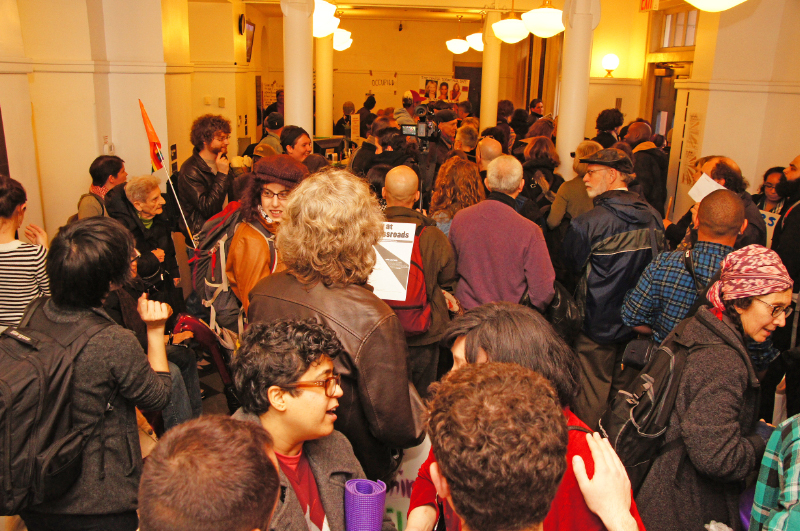 Amy Schiller, in her article, “NYC Politicos Rally Against Brooklyn College BDS Panel,” quotes an anonymous professor saying that the political science department sponsored “Alan Dershowitz’s 2008 Konefsky lecture where he defended torture, where there has been no one presenting the other side.” That short sentence contains two lies: 1) I gave the Konefksy lecture approximately 40 years ago in which I spoke about Professor Konefsky and the United States Supreme Court. It was an entirely academic lecture. 2) I have never defended torture. Indeed, I have repeatedly condemned it. What I have proposed is a method for making those who do engage in torture accountable to the law. The first point is another classic Dershowitz half-truth deliberately designed to deceive. While indignantly declaring that his Konefsky lecture took place 40 years ago and was “academic” in nature, he has the audacity to conceal that he delivered a (non-Konefsky) lecture at BC in 2008 at which he presented without opposition his views on torture (for several minutes of a much longer lecture in which he presented his unopposed views on free speech and Jefferson). So Schiller’s unidentified source (I wonder why he was afraid to reveal his identity) was only wrong about the title of the lecture! Who is the liar here: Schiller’s source who mistakenly believed the 2008 lecture was the famed “Konefsky” but got the other details right; or Dershowitz, whose blanket denial clearly implied that he gave no such lecture at BC in 2008? As to Schiller’s accusation that Dershowitz defended torture, his actual views are so complex and confusing that he can hardly accuse anyone who misinterprets them of lying. Dershowitz essentially argues that torture can work wonders in saving innocent lives, and offers a legal framework for the authorities to conduct such torture of suspects. The aspiring torturer should apply to a magistrate for a “torture warrant” and the torture should be performed by “sterilized needle under the nail.” (Note the careful attention to personal hygiene.) Still, Dershowitz claims, he’s opposed to the practice, despite the heavy price society would pay for forgoing this useful tool. “[Torture] may sound brutal,” he says, “but it does not compare in brutality with the prospect of thousands of preventable deaths at the hands of fellow terrorists.” To complicate matters even more, Dershowitz says he disagreed with the Israeli Supreme Court opinion unequivocally banning torture. Do you understand his position? Apparently Amy Schiller did not, and in Dersh’s view, she is a liar. Actually, in saying that Dershowitz “defended” torture, she most certainly was correct, as he did defend its value while opposing it on principle. If you’re not a Talmudic scholar, don’t even try to understand my (hopefully accurate) summary of Dershowitz’s position on torture. No country in the history of the world has ever contributed more to humankind and accomplished more for its people in so brief a period of time as Israel has done since its relatively recent rebirth in 1948. . . Israel’s research universities have contributed immeasurably to the defense of Israel by the development of technological advances that support the mission of the IDF. . . The Israeli military plays more than a critical role in defending the citizens of the Jewish state. It also plays an important social, scientific and psychological role in preparing its young citizens for the challenging task of being Israelis in a difficult world. . . Some of the same hard leftists who demand academic freedom for themselves and their ideological colleagues were among the leaders of those seeking to deny academic freedom to a distinguished law professor who had worked for the military advocate general and whose views they disagreed with. Dershowitz also said: “The answer to bad ideas is not firing the teacher; but articulating better ideas which prevail in the marketplace.” Tell that to Norman Finkelstein. 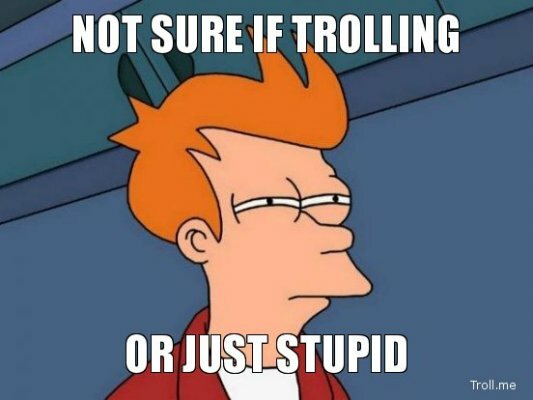 It turns out that some of those “hard leftists” who were not invited by TAU to present their viewpoint were upset with the speech. A letter to the university president signed by 80 faculty members protested Dershowitz’s comments as an assault on academic freedom. 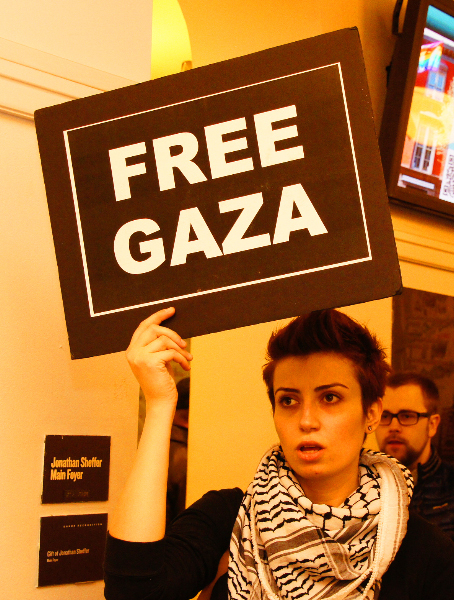 Then there’s the saga of the BDS campaign at Hampshire College in Massachusetts in 2009. While the Administration was considering whether to divest from companies doing business in Israel in accordance with the sentiment of students and faculty, did the Harvard Professor stand by on the sidelines and allowed the debate to proceed without interference? Of course not. He threatened to organize a boycott of contributions to the school: “I call on all decent people — supporters and critics of Israel alike — to make no further contributions to a school that now promotes discrimination and is complicit in evil.” In the end, College President Ralph Hexter caved in a public act of contrition, writing an obsequious open letter to the great moral arbiter from Cambridge, assuring him that the sale of a “problematic” mutual fund had nothing to do with Israel. So much for the “marketplace of ideas” Dershowitz trumpets ad nauseam. The “market” should be receptive to his ideas, but he will do his best to financially punish those who express ideas he does not like. Most recently, Dershowitz authored yet another article in which he claims he has been attacked by the “dogs of defamation” for his pro-Israel advocacy. Item 1: Norman Finkelstein’s allegation of plagiarism, claiming that Dershowitz’s The Case for Israel quoted without citation from Joan Peters’s From Time Immemorial. Space does not permit me to rebut in detail Dershowitz’s claim of innocence, but judge for yourself. Dershowitz quoted verbatim Joan Peters’s very strange version of a Mark Twain quote, including an 87-page ellipsis, and repeated each of Peters’s dumb transcription errors. Yet Dershowitz cited Twain only, claiming that he got the quote himself, and not from Peters. Frank Menetrez wrote in greater detail about this affair if anyone is interested. Dershowitz next complains about the “lie” that he is pro-torture, discussed above. Finally, he gets to the most recent calumny against him, where “the dogs” charge him with hypocrisy on the BC affair because of his own recent history at UPenn. Once again he disavows any contemporaneous knowledge of departmental sponsorship of his anti-BDS diatribe, and fails to mention the praise heaped on him by Penn’s Chairman and President. The message is clear: If you support Israel, we will attack you like we attack Dershowitz, but you will be hurt much more that Dershowitz would. We will damage your reputation, hurt your student evaluations and decrease your chances for tenure. How ironic that the man who played such a large role in ruining Norman Finkelstein’s academic career is now so concerned about hypothetical academic hit men who are sharpening their knives on him in a dress rehearsal for a similar jihad against young, honest pro-Israel scholars. Moreover, Dershowitz’s overall complaint of defamation is a classic example of projection. Dershowitz is accusing others of committing the same offenses he has committed for decades. He has been on the front line of a concerted effort to demonize those who dare criticize Israel beyond the very narrow boundaries of legitimate criticism that he can tolerate. And his own attacks on others has not exactly been moderate and measured. Goldstone is a “moser,” there is a “special place in hell” for Jimmy Carter, Archbishop Desmond Tutu is “one of the most evil men in the world,” Professors Mearsheimer and Walt plagiarized their scholarship on the Israel lobby from David Duke, Norman Finkelstein suggested that Dershowitz be killed; the list is endless. People often comment that Dershowitz is a clown who does not deserve the time and effort to discredit him. I could not disagree more. 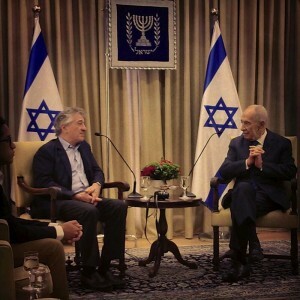 He remains a highly influential public figure on matters pertaining to Israel and Palestine, commanding an audience at the White House and filling lecture halls regularly. Give the devil his due. He has great rhetorical skills, thinks quickly on his feet, and in my opinion can on occasion out-debate far worthier opponents. 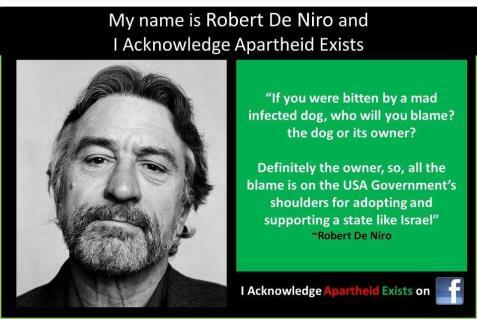 He remains a rock star of pro-Israel advocacy. His brazen hypocrisy and serial dishonesty should be challenged regularly. HaAretz just can’t make up its mind where they are at. Earlier in the day I posted about a hypocritical letter it sent out to the readers of their digital edition promising to match the subscription price with the price of a tree via the racist Jewish National Fund. After my posting they ran an Editorial quite contradictory to the letter. The views are acceptable and in line with HaAretz’s liberal policies. Hopefully they won’t stray again into the darkness of racism. The term “Judaizing the Galilee” provides allegedly legitimate cover for every benighted racist position that sees the presence of Arabs in the Galilee or anywhere else as a national threat. As part of this “mission,” Gapso has decided to block the opening of an Arab school for around 1,900 Arab pupils, children in a community making up about 20 percent of the city’s population. These children must travel daily to the neighboring Arab city of Nazareth, where the schools are having problems absorbing them all. Upper Nazareth is a mixed city, which – like Haifa, Acre, Lod and Tel Aviv – is obligated to open schools for its minority communities. This obligation, stemming from the principle of equal rights for all Israelis, means Arabs have the right to their own schools under the Education Ministry’s aegis, not only in Arab cities but also in Arab neighborhoods in mixed cities. Gapso, who in November asked the Interior Ministry to declare that Arab Nazareth was “hostile to the State of Israel,” doesn’t seem to recognize his obligation to supply separate educational services to his city’s Arab residents. Worse, his opposition to a school for the city’s Arab citizens is a blatant attempt to “cleanse” the city of those citizens, who, he says, “undermine” the Upper Nazareth’s national mission: to Judaize the Galilee. The term “Judaizing the Galilee” provides allegedly legitimate cover for every benighted racist position that sees the presence of Arabs in the Galilee or anywhere else as a national threat. These positions are apparently backed by some of our national leaders, who still haven’t bothered to condemn Gapso’s remarks. One might expect Education Minister Gideon Sa’ar to immediately use his authority to order the opening of an Arab school in Upper Nazareth. But when Gapso makes remarks that Sa’ar apparently supports, and when the interior minister, the authority over the municipality, espouses racist views himself, Israelis who oppose racism and discrimination – Arabs and Jews alike – have no choice but to vote for parties that will fight both phenomena. The English edition of the liberal Zionist paper has a global reputation and is read and trusted by many Palestinian rights activists, who often look forward to the work of dissident journalists like Amira Hass and Gideon Levy. Recently the paper put its English edition behind a paywall, requiring a subscription to read articles. But this link-up with the JNF is a new reason to make you think twice before handing over your money to Haaretz. Israeli newspaper Haaretz is currently circulating this email. Subscribe to the paper’s digital edition during an upcoming Jewish holiday season and you will be helping the work of the Jewish National Fund, it promises. The ad promises that for each new subscriber to Haaretz, the JNF will plant a tree in the Carmel forests (in the vicinity of Haifa) to help replace those that were burnt down in huge 2010 forest fires. But as Max Blumenthal wrote for The Electronic Intifada at the time, many of these trees were planted on the ruins of destroyed Palestinian villages – deliberately so in order to cover up Israeli crimes. After 1948, when Zionist militias drove out 750,000 Palestinians by force, the new state of Israel destroyed hundreds of their villages hoping to ensure the Palestinian refugees could not return. In many cases, the JNF planted trees on the ruins. 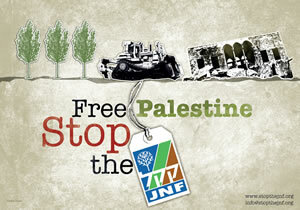 Palestinians and their supporters have protested against the JNF with a group called Stop the JNF making some headway in the UK, for example. 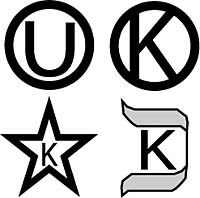 Operating as a registered charity in many countries, the JNF is a long-standing Zionist institution with quasi-governmental status and authority over land in Israel – which it holds in trust for Jews only. As well as a long history of planning for and implementing the ethnic cleansing of Palestine, stretching back to even before the 1948 Nakba, it’s also linked to more contemporary expulsions. The “unrecognized” village of al-Araqib, for example, has reportedly been destroyed by Israel and rebuilt more than 40 times since 2010. In October 2012, Budour Hassan reported for The Electronic Intifada that JNF representatives raided the 5,000-strong town of Bir Hadaj (which is ostensibly “recognized”) alongside the interior ministry, handing out demolition orders. When local youths protested, police invaded, firing tear gas, rubber bullets and some live ammunition. But globally, the JNF promotes itself as a “ecological” charity, playing down its involvement in these abuses against Palestinians. Haaretz focuses on this greenwashing narrative. With thanks to Jonathan Cook for drawing attention to this email. THIS YEAR’S NOBEL ‘WAR’ PRIZE GOES TO …..
Maybe next year’s winner will be Netanyahu?? As one former recipient sees it …..
Alfred Nobel was a visionary who believed in a demilitarized peaceful world. In his Will he left his Nobel peace prize to those who would work for ‘fraternity among nations’,’abolition or reduction of standing armies’, and ‘holding and promotion of peace congresses’. In Nobel’s will the award for Peace was to go to Champions of peace, those working to replace militarism with international order based on law and the abolition of national military forces. Nobel’s vision and dream was to replace the power of militarism and war, with the power of law. I believe the Awarding of the Nobel Peace Prize to the European Union, does not meet the criteria of Alfred Nobel vision and spirit, and his vision of a demilitarized peaceful world. In many ways the European Union has done much in the past sixty years for Peace and reconciliation amongst nations, but it has sadly done little for the demilitarization of Europe. Whilst the EU imposes severe Austerity measures upon many EU countries it simultaneously supports the growing militarisation of Europe by its support for US/NATO (guilty of war crimes against Iraq, Afghanistan, etc., ) It continues to support the policies of USA Nuclear weapons, held in six EU States. It supports arms sales from European States (UK, Germany, etc.,) to countries all around the world. The EU instead of upholding human rights for countries such as Palestine, has rewarded Israel by giving them special trading status and huge grants (EU tax payers money) for its Military Research and weapons thus enabling it to continue it illegal policies of occupation and Apartheid of Palestine. 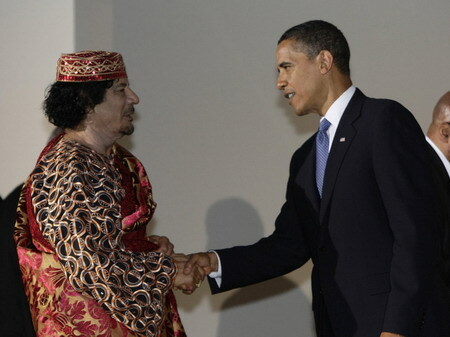 I believe that the reform of the nobel peace Committee is now necessary. As is the case of all other nobel prize committees which are made-up of experts in their particular field, perhaps it is time too for the NPP Committee to be comprised of people experienced in the field of Peacemaking and International Law. On Rosh Hashanah, when we sit down to the festive meal, when we raise colorful foods and say the blessings and the wishes of the victimized, the powerless, the persecuted, those who bear the scars of pogrom, of hatred, of institutional poverty, of ingrained, fiery prejudice, when we ask that we be spared, we must now include among ourselves, those whom our own people have victimized. Every year, we make the same wish. And every year, the tragic colors of that year make the substance of the wish entirely different. God of Abraham, and of Iran, and of Aleppo, on this, the dawn of Rosh Hashanah, a new year, we say these words to leave an old year behind, Tichleh Shanah V’kil’loteha: May this year finally end, and with it, all of its curses. This year, for example. For Israelis, a year of feeling caught in the cross-hairs of one potential genocide, and helpless in the face of an actual genocide being practiced just to the north. But there’s more. Much more. The curses we have brought on ourselves. In Israel, this has been a year of shocking expressions of hatred and acts of terror, of Jews against non-Jews. And in all too many of these, though the victims were innocents, the assailants believed themselves to be defending a godly purpose, or acting according to a wholly worthy principle. As this Rosh Hashanah nears, this season of moral bookkeeping, of human debt, of the foreclosure of conscience, many of the perpetrators seem to see no need to ask forgiveness. Perhaps worse, some may believe that asking forgiveness of their non-Jewish victims is wrong, a blasphemous kowtow, a betrayal of the faith. 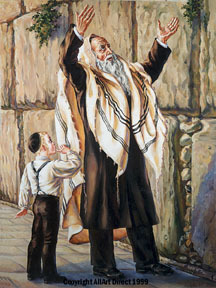 All of which makes this year one in which we, as Jews, will need to ask forgiveness on behalf of those who will not ask. God of all of us, you may well be as sick of this year as we are. May we, before this New Year begins, before we finish the blessing, ask the forgiveness of all of Your children whom we have harmed. Our God is the God of Latrun. The God of the Trappist monastery where someone, angry at the Israeli government for forcing Jews out of an illegal outpost, set fire to the doors and wrote “Jesus is a monkey” in Hebrew on its walls. We, the rest of us, beg forgiveness. Our God is the God of Zion Square and a pasture south of Hebron. In two separate attacks last month, Palestinians causing no harm to anyone, were beaten unconscious. Our God is the God of the Hassan family of the West Bank, whose car was firebombed, injuring five members of the family, among them two four year olds. Three boys from a settlement have been arrested in connection with the bombing. No one suspected of participating has expressed regret. We apologize in shame, and ask for pardon. Our God is the God of Neve Shalom/Wahat al-Salam (Oasis of Peace), an Arab-Jewish village in Israel which promotes co-existence. Earlier this year, the tires of 16 cars were slashed in the village, and slogans such as “Death to Arabs” were sprayed on vehicles and on the walls of its bilingual, bicultural elementary school. Our God is the God of the villagers of Burim, near the West Bank settlement of Yizhar. This week, dozens of olive trees belonging to the village were hacked apart, shortly before harvest season. Our God is the God of the refugees from Africa, the people of the fences, those who have made it in, and those trapped outside. Those who are slated for internment camps after Yom Kippur, and those who, though they are children who have never known another country, may be deported anyway. As our God is the God, also, of the Jewish victims of the Jews. The God of eight-year-old Naama Margolis of Beit Shemesh, spat upon and cursed for dressing not to the liking of a certain yeshiva. 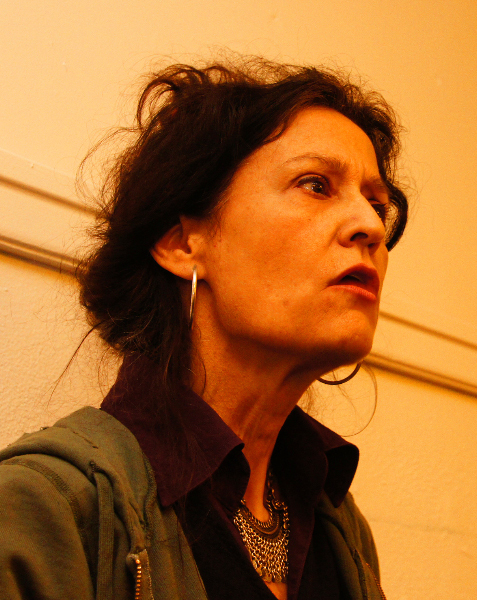 And the God of Hagit Ofran of Peace Now, whose home was repeatedly sprayed with death threats. All of these, the victims, they are our heroes. All of these, the assailants, they are our curse. We know those people who were caught between the fences, far from homes they cannot return to, vulnerable. We were these people. We know those people attacked for their religion, scapegoats for misplaced rage. We were those people. And not long ago. Tachel Shanah U’virko’teha. Let the New Year begin, with all of its blessings. Romney’s campaign is based on a vigorous attack on Obama’s attitude concerning Israel, with an eye on Jewish voters in swing states, such as Florida. Romney to meet with Netanyahu, Barak, Lieberman, Peres, and Israeli opposition leaders in Jerusalem. Mitt Romney and wife Ann arriving in Tel Aviv, Israel, Saturday, July 28, Photo by AP2012. Three months before the presidential elections, and in the midst of an aggressive campaign against President Barak Obama, Republican hopeful Mitt Romneyarrived in Israel hoping to swerve Jewish voters to support his candidacy. 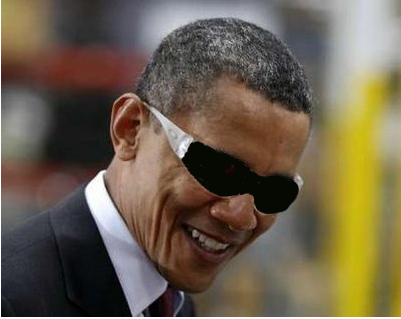 Meanwhile these efforts have fallen rather flat: according to a recent Gallup poll, 68 percent of American Jews still support Obama, compared to 72-74 percent four years ago. Still, Romney can probably count on the support of his host in Jerusalem, Prime Minister Benjamin Netanyahu. Aaron Miller, who served in the Clinton administration, wrote a few days ago in Foreign Policy, that when Netanyahu will blow out the candles on his birthday cake, two weeks before the elections, he will wish for a decisive Romney victory. Obama and his campaign managers are doing their best to check Romney’s criticism, claiming that as opposed to the Republican candidate, the administration’s deeds, not words, strengthen the alliance with Israel. Netanyahu vehemently denies that he is interfering in U.S. politics, but as he himself is fond of saying: if it walks and quacks like a duck, it’s a duck. Netanyahu’s close associates, such as his political advisor Ron Dermer, are firm supporters of the Republicans. Some of Netanyahu’s strongest backers – Casino magnate, Sheldon Adelson for one – are among Romney’s campaign largest donors. The U.S. media has reported several times that Adelson has pledged to donate no less than $100 million to Romney’s campaign to oust Obama. The New York Times reported that Adelson will visit Israel at the same time as Romney, and one can assume that the two will find time to meet. Romney visit will last slightly longer than 24 hours, but he will be well received by Netanyahu, who will do his best to make the visit politically successful. The two will meet in the morning at the prime minister’s office, and briefly meet the press, before meeting again in the evening for dinner at the prime minister’s residence with their wives. One small anecdote can reflect the importance Netanyahu attaches to the visit’s success. Until a week ago, Romney was planning to hold, in the very same evening a fundraising event at the King David Hotel in Jerusalem. But then he was told that the event was due to begin before the end of the Tisha B’Av fast, commemorating the destruction of both temples. Romney and his team found themselves in an embarrassing situation. At first they postponed the beginning of the dinner until after sunset, but that still wasn’t enough to quell the criticism. The prime minister’s office came to their rescue offering a solution – instead of a fundraising event, Romney and his wife will join the Netanyahus for an after-fast dinner. Netanyahu, by the way, has no intention of fasting, but his office said that in such a symbolic evening he could explain to Romney the dangers facing Israel. The fundraising event, incidentally, costing some $50,000 will still take place, but only on Monday morning. Words …. Nothing but words! Israelis were reminded yesterday that Bob Dylan performed here a year ago. All of the major radio stations ‘rubbed it in our faces’ as they played his recordings. BOB DYLAN WILL YOU HEED THE CALL? You have been part of a civil rights movement. You have been able to raise your voice louder than others, you can do it again. We are asking you not to perform in Israel until it respects Palestinian human rights. A performance in Israel, today, is a vote of support for its policies of oppression, whether you intend for it to be that, or not (2). Choosing not to perform will effect over 3 and a half million lives, living under brutal occupation. As we write this, Israel continues a practice of ethnic cleansing and it is systematically driving its own Palestinian citizens off their lands. Israel is keeping a population of millions under martial-law in the West Bank, and yet another threat of wholesale massacre is looming in Gaza, in the last few days. In the late of night of 21.3.11 the Israeli air force attacked Gaza, bombing the most populated area in the world from the sky. 8 children under the age of 17 lost their lives (3). This is not an out of the ordinary occurrence, or even a rare one. Over half the population of besieged Gaza are minors (under 18 years of age), over a million are registered refugees. They are trapped inside the biggest open-air prison in the world and are under a real and immediate threat of death, as we speak. 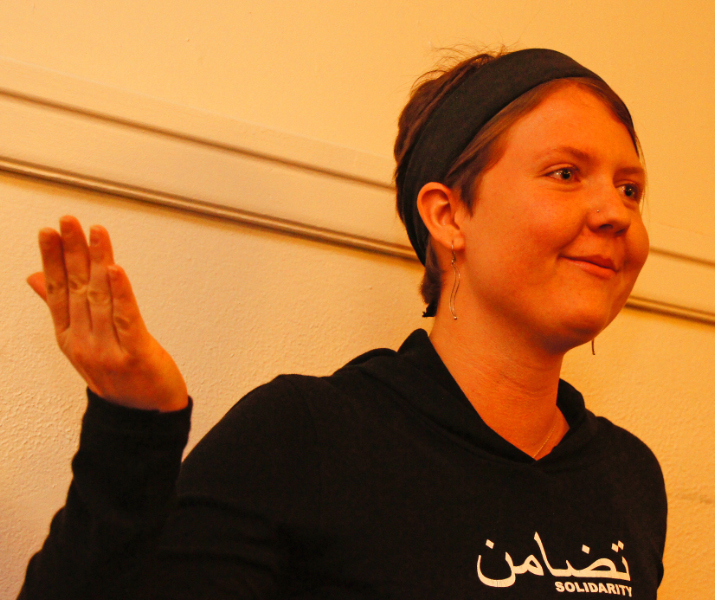 In 2005 over 170 (and growing) civil society Palestinian groups came together and signed the BDS call. BDS is a powerful and united civil initiative in the face of a brutal military occupation and apartheid. It’s a nonviolent alternative to a waning armed struggle and it has reaped many successes and instilled much hope, in the past 6 years. BDS is a long process in which those of us who live here are deeply invested in, knowing that there’s a personal price, which non of us could withstand alone. That is why we ask for support from the international community. Your celebrity status affords you a leading role. You may choose to block the halls, or heed the call. But, fame and fortune won out in your mind as you ignored all appeals of reason by acivists who were at your side for decades. Now you have chosen a new side with new supporters …. As for your ‘music’, truth is it makes me gag when I try to listen to it today. There is nothing wrong in holding protests against government repression and human rights violation anywhere in the world. However, when championing the cause of human rights is motivated by short-sighted political expedience, highly-selective, moral confusion and moral impurity blur the picture. I am not suggesting or demanding that at a single demonstration one would have to protest all human rights violations on earth, although this would be a good thing to do. 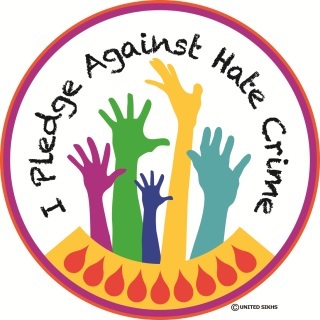 The hypocrisy of these gurus of racism and mendacity becomes really stark when we see them refrain from voicing even a gesture of dissatisfaction with real atrocities, some of which are quite comparable to Nazi crimes against Jews during WWII, on no ground other than the fact that the villains happen to be Jews and the victims are non-Jews. I would want to know how many times have these so-called rabbis taken part in protests against Israel’s Naz-like policies in the West Bank, Gaza Strip, East Jerusalem and Israel proper? How many times have these important figures protested the demolition of Arab homes, the vandalism of Arab orchards, the torching of Arab fields, the open-ended detention of innocent Arabs without charge or trial, the desecration of Muslim and Christian holy places at the hands of government-backed Jewish thugs and terrorists as well as the recurrent murderous air-raids on helpless Gazans which kill, maim and incinerates thousands? The five-year ongoing blockade of the Gaza Strip have caused a virtual starvation throughout the coastal enclave, but most Jewish leaders, rabbis and otherwise, have remained silent, as if this was happening on another plant. I know the answer too well. These rabbis’ consciences are alive only when Jewish lives and Jewish rights and interests are in question. However, when Gentile lives, rights and interests are the issue, we see these rabbis succumb to apathy and disinterest. In fact a good many of these people don’t content themselves with silence and apathy, they actually morph themselves into hysterical mouthpieces for the Israeli government and genocidal settlers by strongly defending every atrocity and every massacre perpetrated in cold blood by their brethren. A few years ago, Israel launched a blitzkrieg against the nearly helpless and virtually unprotected, and thoroughly blockaded Gaza Strip, using state-of-the art of the American technology of death. As mentioned above, this nefarious aggression came on the heel of a hermetic blockade which put about two million people on the verge of starvation. Unfortunately, not a single word of protest was uttered by people like Wiesel and his elk against the mini-genocide in Gaza. Far from that, the pseudo-moralist did every thing he could to defend Israel’s shameful act, and he did it in the name of the holocaust and its survivors!!! Why do many Jews adopt such distinctively duplicitous, manifestly unethical stances and scandalously inconsistent attitudes when relating to crimes committed by Jews and crimes committed against Jews? Do these rabbis and self-centered thinkers really believe their ancient myths that non-Jews are beasts of burden created by the Almighty so that they may serve Jews, as the spiritual mentor of Shas, Ovadia Yosef, said last year? Do they think, as many within the Chabad cult, that the lives of non-Jews have no sanctity and can be expended without the slightest compunction? One rabbi from this particularly evil cult was quoted as saying that a Jew may murder a Gentile in order to extricate the victim’s organ if the Jew needed one? I am not interested in vilifying and demonizing anyone, including Jews. I know well that there are many conscientious and humane Jews out there. But, unfortunately, the damage and ill-will caused by villainous Jews exceed by far any amount of good will generated by good Jews. The Jews are an influential people in our world today. They control power nations and governments, including the only remaining super-power in the world, the United States . Instead of gearing American policies toward embracing and supporting apartheid and oppression in Palestine (because the oppressors and practitioners of apartheid happen to be Jews), Jews can steer American policy toward promoting a moral world based on justice and morality, not on power politics. We have experienced “power politics” since the beginning of time, and it proved utterly disastrous if not suicidal. It is becoming a common occurrence in Israel to hear about Jews burning churches, spitting on Christian clerics, burning Christian Bibles and intimidating and harassing other Jews who believe in Jesus. Unfortunately this is almost unheard of from the Western media. If it was not for the internet this would be unknown to millions of people around the world. Here I am presenting one example of the rampant discrimination and xenophobia against Christians that exists in the “Jewish state”. Please feel free to copy and post this video in other sites. In Wall Street Journal op-ed, Michael Oren compares what he calls the current repression of Christians in the Muslim world to the expulsion of Jews from Arab states. “Yet Israel provides an example of how this trend can not only be prevented but reversed. With the respect and appreciation that they receive in the Jewish state, the Christians of Muslim countries could not only survive but thrive,” Oren wrote. Perhaps this Oren guy should take a daytrip to the illegal settlements (including Jerusalem) to see the reality he seems ignorant of. Recently named best gay city in a contest, Tel Aviv has seen a sharp rise in gay tourism. The city has long been referred to as a “bubble” for its openness in a region not known for tolerance towards homosexuality – something that seems to add to its allure. Israel’s Tourism Ministry launched a campaign three years ago to promote gay tourism. Their efforts seem to have paid off. Gay tourism consultants have been flooded with requests, and attendance at Tel Aviv’s annual pride events was up 25% last summer. 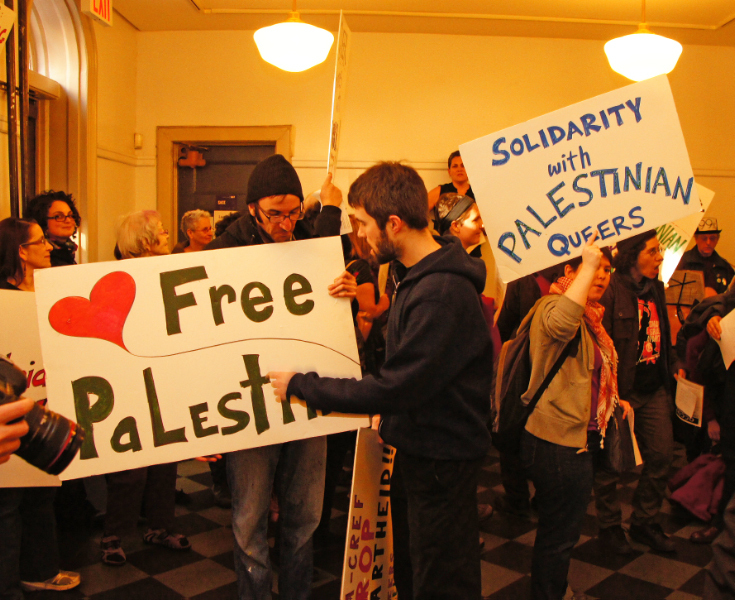 So, Israel wants their bucks ….. but they must remain silent on Palestinian issues ..
A battle has been going on at New York’s LGBT Centre for over a year …. 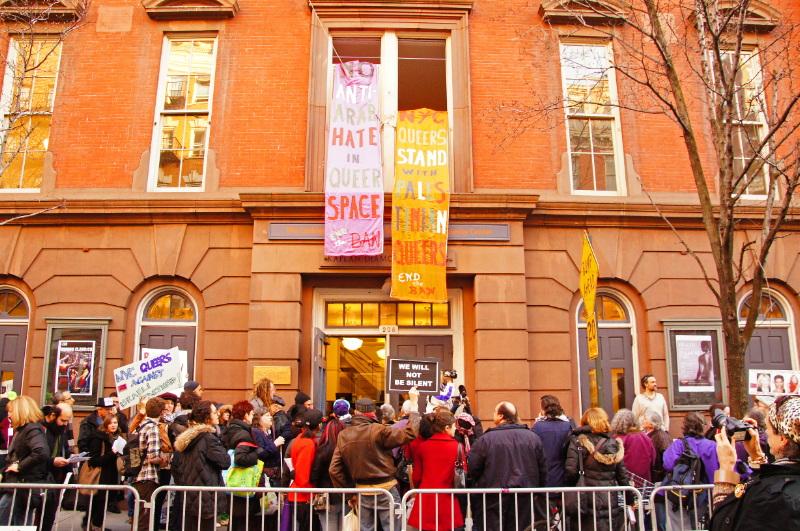 Taking Pinkwashing to a whole new level, one of Israel’s very very good friends– gay male pornographer Michael Lucas– is boasting that he single-handedly got NY’s Lesbian Gay Bisexual and Trans Community Center to not only cancel a “Party to End Apartheid” fundraiser to cover costs for Israel Awareness Week, but to ban the group from ever renting there again. Read THIS post from the archives..
Also read THIS letter that deals with the Occupation of Palestine…. 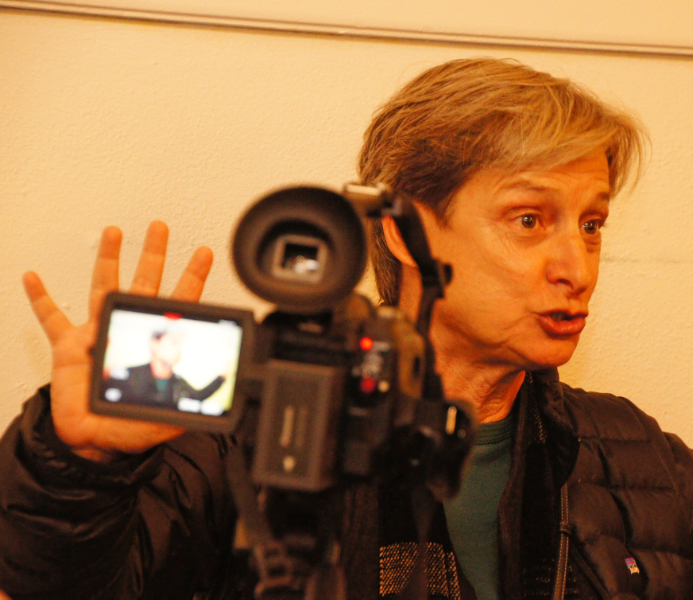 We are a diverse group of lesbian, gay, bisexual, queer and trans activists, academics, artists, and cultural workers from the United States who participated in a solidarity tour in the West Bank of Palestine and Israel from January 7-13, 2012. 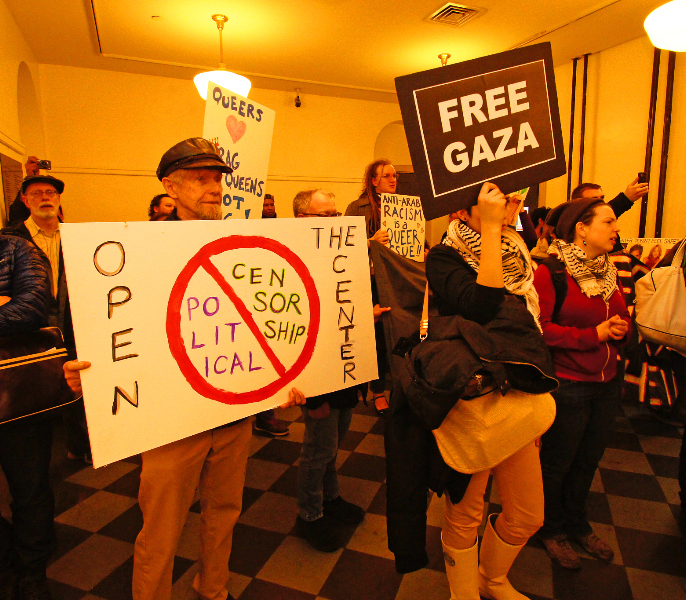 The center has not budged on the decision made last year to keep gay pro- Palestinian rights groups out of the center except to also ban NYC Queers Against Israeli Apartheid along with Seigebusters. ( See below.) 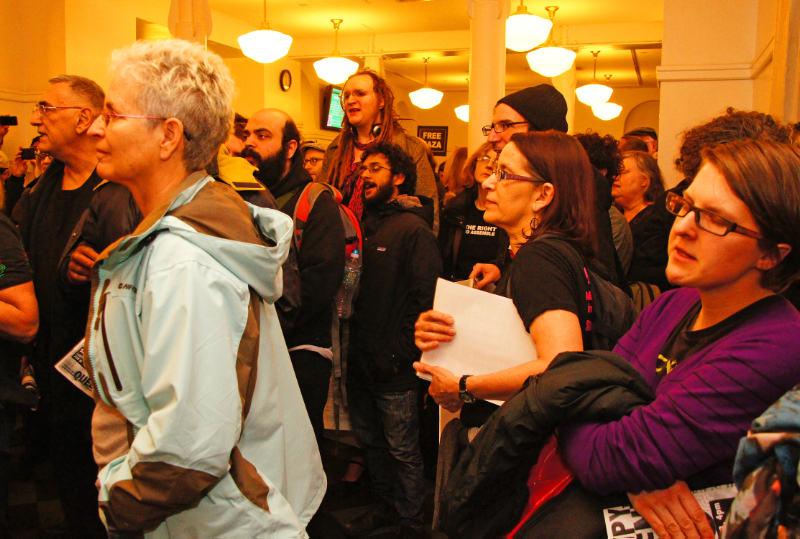 Yesterday members of those 2 groups along with members of the center who oppose the administration’s censorship, and some supporters of the various Palestinian human rights groups, occupied the center for about 2 hours and held a rally in the lobby there. 150+ people were there. The rally included speakers, songs, and chants. 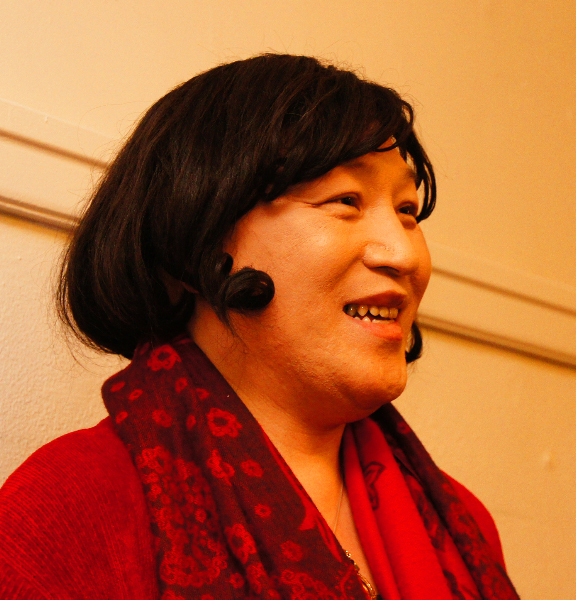 Several speakers pointed out that the Israeli treatment of Palestinians was very much a queer issue because they too are singled out for persecution, efforts are made to isolate and segregate them also and they have very limited rights. These thoughts were presented very passionately. Since the center has banned any discussion of Palestinian rights this meeting defied that ban. We hope you will join Queers Against Israeli Apartheid and the 15 other groups that have endorsed the call for action this Saturday…see list below. 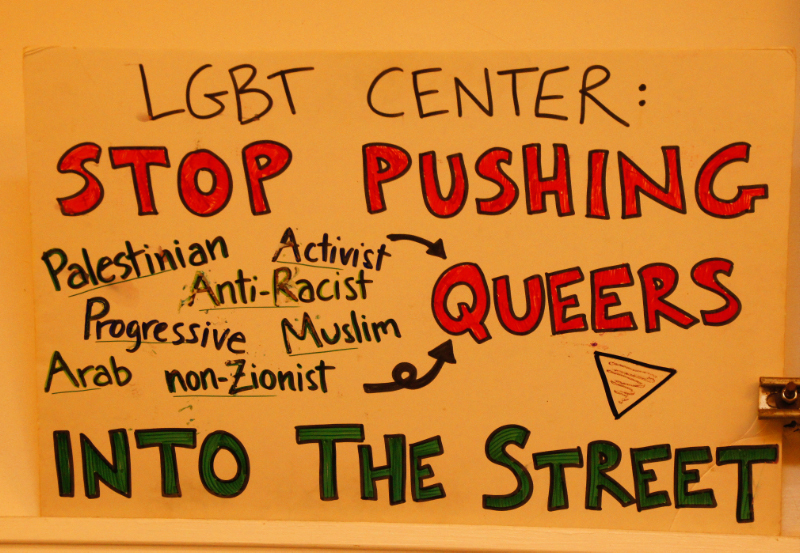 On March 3rd we will gather at the LGBT Center from 4 to 6 pm to mark the one year anniversary of the Center’s banning of groups opposing Israeli apartheid. 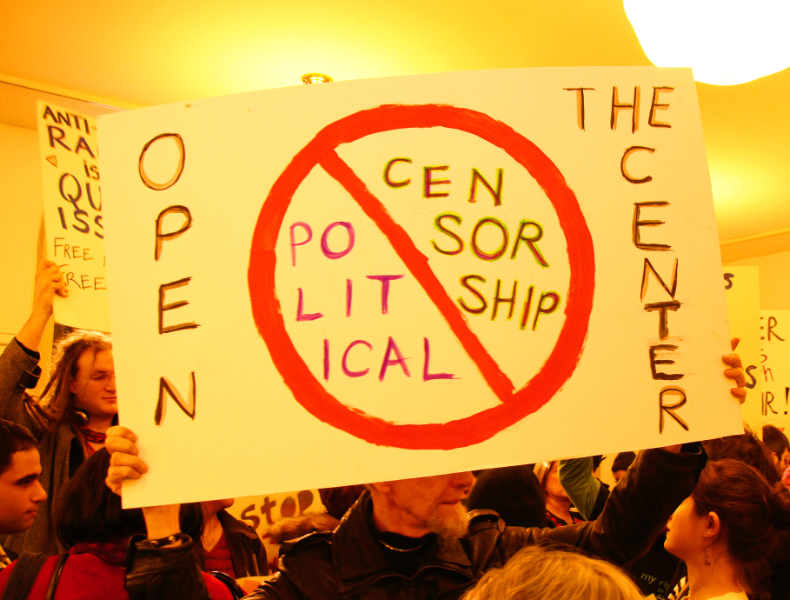 We will confront the Center’s censorship policy and its secret closed-door board of directors meetings. 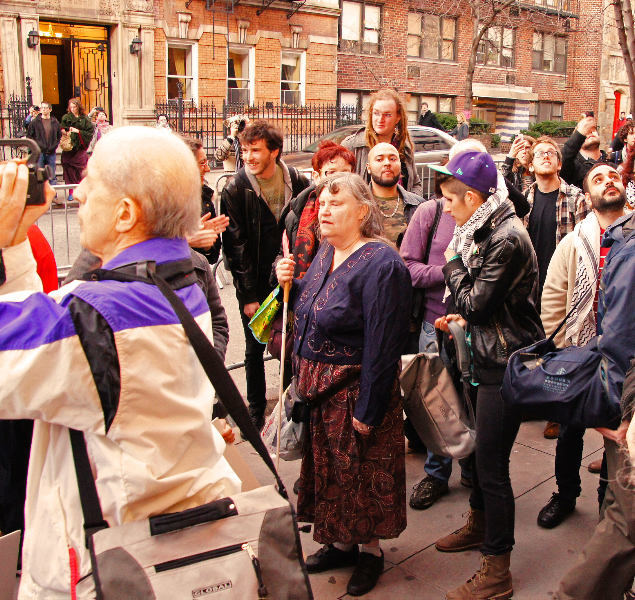 It’s been a year since NY’s LGBT Community Center banned Siegebusters, the anti-occupation organizers, from using space at the Center. 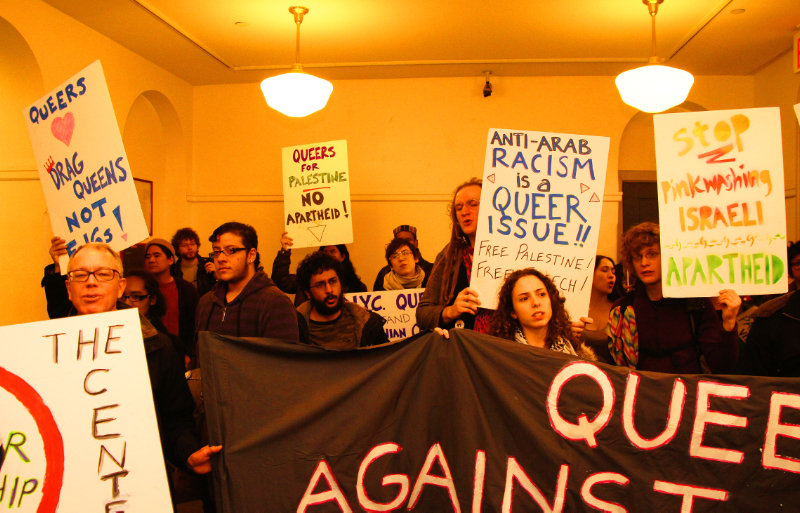 Since that time NYC Queers Against Israeli Apartheid has also been banned from the Center—and a “moratorium” has been imposed on ANY discussion of the Palestinian-Israeli conflict (meaning “discussion” of support for Palestinian rights). 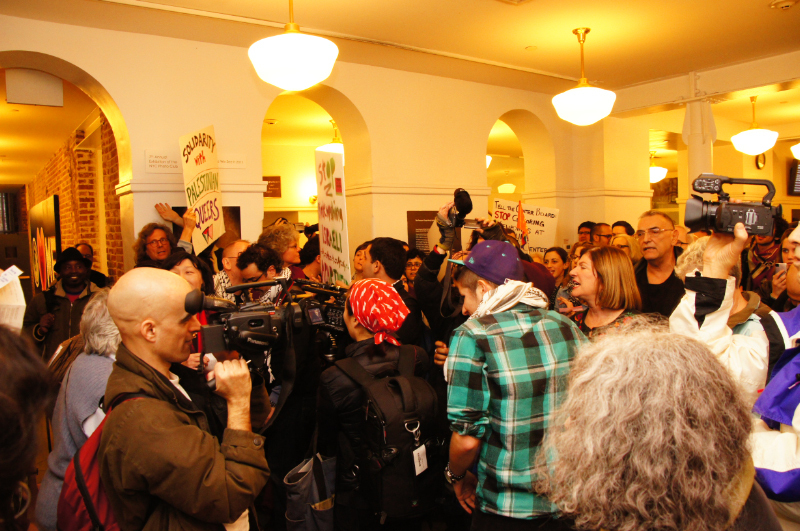 The Center’s board promised, but never delivered, a policy revision clarifying their rental/access/programming guidelines. 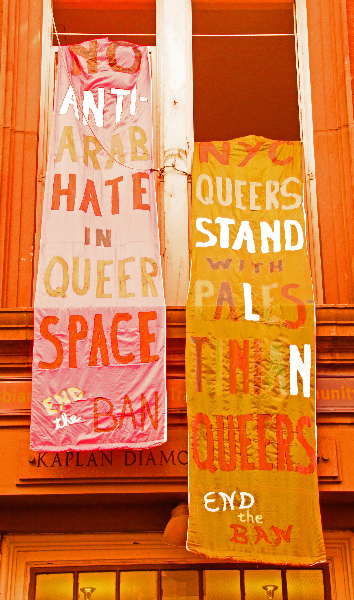 On Saturday, March 3, as part of Israeli Apartheid Week, we will end the ban on Palestinian-related organizing at the Center, and re-institute the Center’s original access policy of full inclusion for all queers who organize for liberation. The “moratorium” is over! 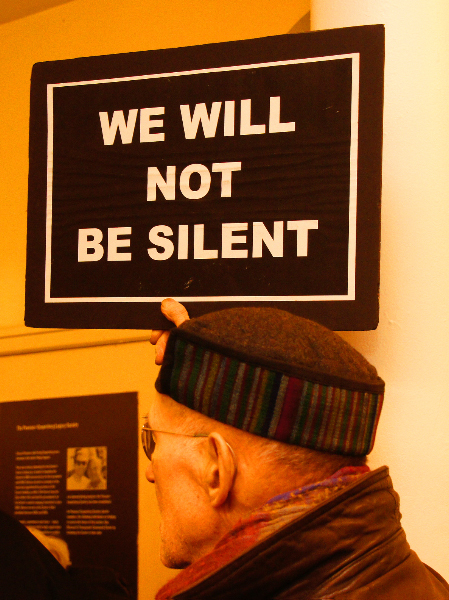 The wealthy and powerful 1% should not be allowed to silence the voices of the 99%. 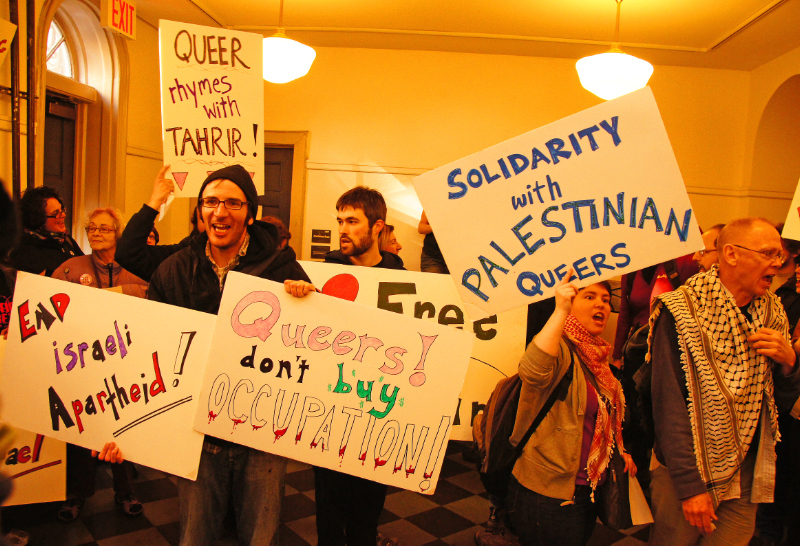 Queers Against Israeli Apartheid will defy the ban on March 3 — Occupy the Center! 2. Open the Center to all who respect its stated mission. 3. 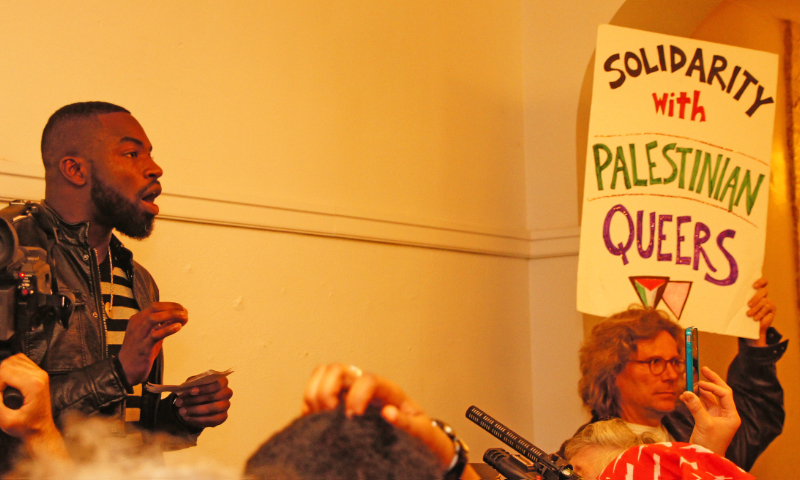 Open the Center’s board meetings and decision-making process to the community. 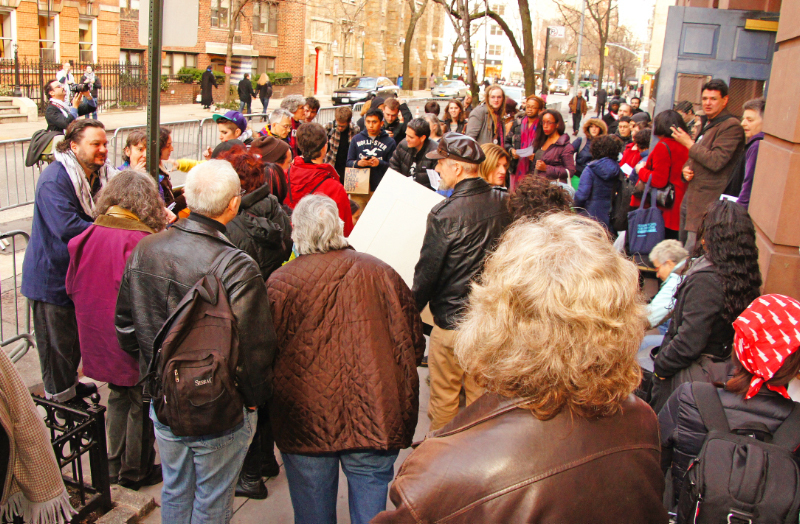 After the initial protests inside the centre, the activists moved outside in front of the building. To hugh cheers, two banners were dropped from the center’s windows. ‘CHRISTIANS’, $END U$ YOUR MONEY, BUT STAY AWAY FROM ISRAEL! The Christian volunteers are part of a large group of American volunteers affiliated with Yuval – a pro-Israel Evangelical organization. The group includes dozens of people, and their stay in Har Bracha was made possible after the community rabbi, Eliezer Melamed, met with them and ruled that they are not missionaries. The community spokesman, Yaakov Idels, added: “Rabbi Melamed looked into the issue thoroughly and came to the conclusion that in this specific case there is no reason for concern, as this is a good thing. The rabbi’s stand is supported by Har Bracha Committee Chairman Yonadav Zar. “The Christian volunteers came here to help. Naturally, they need a place to stay and we’re happy to accommodate them. Former Jerusalem Council Member Mina Fenton, who has launched several battles against Christian organizations in Israel, is unimpressed by the calming messages of the community representatives. “This is a very serious affair,” she says. “It’s the first time Christians are accommodated in a Samaria community, and the first time the rabbi approves of it. I’m not sure that he had all the information on the nature of these people. “I’ve learned about these Christian volunteers and others. They began as a one-family project, and now they’re an organization of hundreds of people with Christian goals. When the Rabbinate in Israel isn’t being racist, they’re just being plain stupid…. Israel’s Chief Ashkenazi Rabbi Yona Metzger on Tuesday announced the discovery of a special goose species, which tastes exactly like pork. One question comes to mind ….. how does the Chief Ashkenazi Rabbi know what pork tastes like? It turns out that farmers in Spain recently decided to breed geese in non-industrialized pasture lands. As opposed to the modern methods, they didn’t fatten the geese, but gave them natural food. When the farmers tasted the first chunk of goose liver, they were amazed. “It tastes like pork,” they cried out. They decided to share the sensational discovery with the chosen people, and sent a halachic query to Chief Rabbi Metzger. The latter demanded a second opinion, and asked that the goose liver be sent to three non-Jewish professional chefs in Europe, who are very familiar with the taste of Pork. The three chefs confirmed the discovery of a “rare culinary duplicate”. 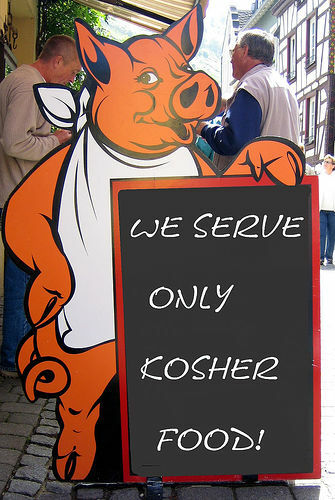 So how close are we to a pork-flavored Shabbat meal? Metzger tried to lower expectations on Tuesday, saying that the geese were still young and that the import of the meat is still being examined. Rabbi Metzger made the remarks in a conference presenting future hospital food. The conference was also attended by Deputy Health Minister Yakov Litzman and the winner of the first season of “Master Chef”, Ina Kravasky. WE WERE SLAVES IN EGYPT … WE ROAMED THE DESERT FOR FORTY YEARS … NOW LET’S EAT! 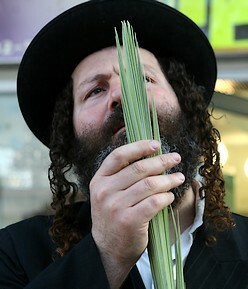 Tomorrow night at sundown Jews throughout the world will celebrate the Festival of Succot. A non Jewish visitor to Jerusalem this week might get the impression that the entire city stands in solidarity with the homeless people illegally evicted from their homes by settlers. Nothing could be further from the truth. Tents have appeared (actually booths) in preparation of the Festival. 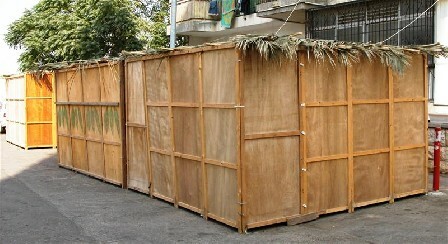 Family homes were STOLEN, many families have been living in makeshift tents for over two years…. and neither the Municipality of Jerusalem nor the Palestinian Authority gives a damn. As winter approaches, a new meaning is given to the term ‘settlement freeze’ as these homeless literally freeze in their abodes. Succot without the palm frond is like Christmas without the tree … perish the thought. 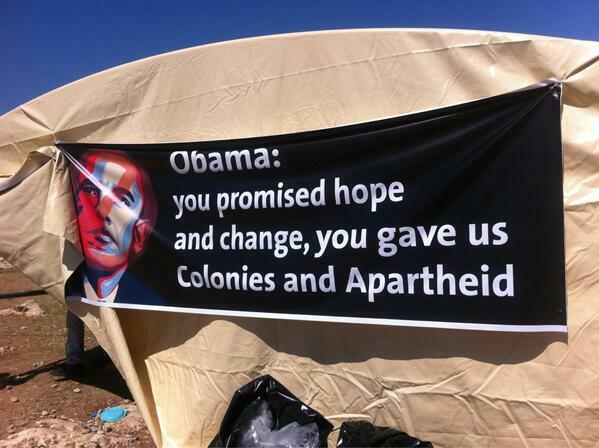 But, thankfully the hypocrisy of zionism itself saved the day.